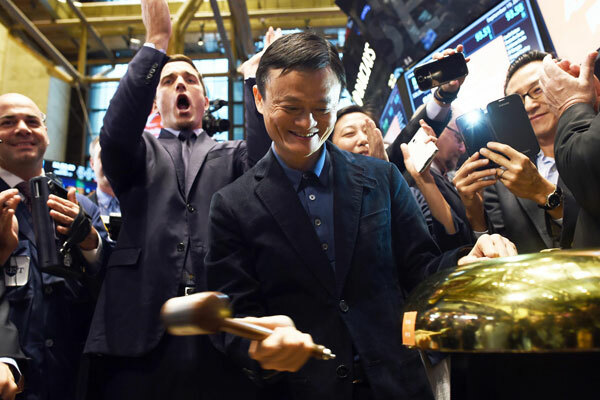 He has been the recognisable face of Alibaba since launching it from his Hangzhou apartment 15 years ago, but for the ringing of the bell to mark the US$21.8bn company’s IPO opening at the New York Stock Exchange, founder Jack Ma stepped away from centre stage. Instead, to celebrate what would turn out to be the world’s biggest public offering last month, eight customers of the e-commerce titan stepped into the spotlight for an historic photo op, taking the place of the company’s top brass. Depriving the moment of its most powerful brand — Ma — for a group that ranged from a Washington State cherry farmer to a Chinese bracelet seller was a pretty risky strategy. But it paid off. Amid all the hype and media coverage, the move, reportedly planned for weeks and kept secret from customers themselves until the big day, was seen as typifying the company’s approach to the tricky process of building interest in a new market and keeping true to brand values while not over-inflating expectations. Labelled a "phenomenal success" by Bob Zito, founder of Zito Partners and former executive VP of the New York Stock Exchange, the good news marked a reassuring contrast to recent years, during which high interest in Chinese businesses had turned. These firms were taking a battering in US markets from short sellers like Muddy Waters, which sought out weaknesses and exploited them ruthlessly. So how had Alibaba handled expectations so successfully, and what lessons can other Chinese businesses with their eyes on the States learn? While Alibaba declined to comment for this piece, citing a post IPO ‘quiet period’, one PR figure close to the process disclosed that the focus was on "a clean, soft and controlled landing". Not an easy task for what had been until recently a juggernaut of largely unknown proportions for many investors. Well before the listing process began was the slow and steady building of a the company’s brand. Ma showed awareness of this from the very start, telling the media that he picked the name Alibaba because "everyone knows the story of Alibaba. He’s a young man who is willing to help others." It sounds simple. But as Cohn & Wolfe’s China MD and chief branding officer Marina Leung asserts, "a lot of companies in China do not fully understand the value of a brand in terms of what they can achieve with it", adding that there is often an underestimation of how important non-financial markers and "the integrity of the mission" are for underwriters, foreign investors and banks. The long-term clarity and strength of the overarching Alibaba story as a marketplace where buyers and sellers connect helped it handle reputational threats, such as consumer concern over fraudulent listings, to its ten businesses along the way. The company had taken a few knocks, but a strong overall brand in the domestic market helped it handle them. This gave it a strong base to work from ahead of the IPO filing. However, it was Alibaba’s ability of to anticipate, react to, and communicate based upon a new set of standards and expectations in the shorter term that proved crucial to its success. For example, when faced with suspicions over corporate governance and transparency regarding Chinese business in the minds of some investors, and question marks hanging over some of its own conduct, the company did thorough due diligence on its weaknesses. The result was a filing, issued in May, that included a list of risk factors which ran to 44 pages, twice as many as was provided by Facebook. This covered everything from concerns about the country’s internet infrastructure through to the Office of the US Trade Representative formerly labelling its markets as "notorious". The label has since been revoked. Clear, thorough and well presented, the document demonstrated a business that was willing to open itself up to new levels of scrutiny and regulation. Enough, if not all, concerns were addressed. As the PR insider says, "we wanted to diffuse concerns that people would see this business as problematically governed", adding that "while governance questions lingered" they "never overwhelmed" the process. For FTI Consulting’s senior MD Cara O’Brien, this period of introspection and subsequent divulgence is something that other businesses seeking to make their mark in the US would do well to emulate. O’Brien, who handled work around Beijing-based Autohome’s IPO in the US last year, says that firms "doing the bare minimum" to meet disclosure regulations in China will have to step up their game if they wish to succeed, especially in America. Demands regarding transparency from the consumer, too, are greater. "Companies can be very vulnerable if they’re not very open," she asserts, "as people won’t understand your business and will think you’re hiding something." Aware that communications requirements were different, Alibaba also brought in outside help for the process. Having added Brunswick to its existing PR agency line up of Hill + Knowlton Strategies and Sard Verbinnen & Co, following the IPO filing Alibaba also bolstered its internal team with a string of hires from the States, including former PepsiCo executive and Treasury aide Jim Wilkinson. Ma described Wilkinson’s hire as being about "building bridges across geographic boundaries", and Wilkinson’s cross-sector experience speaks of the increased importance of a holistic approach to communications in a market where stakeholder engagement is a complex proposition. Having seen it himself, APCO senior director James Robinson warns against companies attempting to manage major engagements with the US market solely from China "due to cultural sensitivity or insecurity. It is important to have a management team on the ground." This helps companies used to operating in the "fairly stable, highly regulated environment" of China who may find the shift to "understanding a multi stakeholder environment where no one stakeholder in particular can guarantee your success" a "challenge," says Robinson. Alibaba’s willingness to engage with a range of stakeholders was further demonstrated in its 10-day pre IPO roadshow, where the focus is often less about the finances than the ‘personality’ of the company. As well as putting on 100 investor presentations in 10 countries, the company thrust its executive team into the spotlight, released engaging video content and competently handled the media. Businesses would do well to take note of Ma’s relaxed, conversational style, which went a long way reassuring audiences in the US that, as Zito puts it, "this is a man they can trust and do business with. They feel that it is not scripted and understand the person behind the words." Ogilvy & Mather’s Lyndon Cao, who runs the firm’s China practice in New York, claims that the resonance of the message typified in Alibaba’s roadshow went deeper. Though led by Ma, the messaging found commonality between China and the States by talking about "the average Joes" that helped built the company and was typified in the bell-ringing move at the New York Stock Exchange. "A very common mistake that Chinese companies make is that they love to talk statistics," he says, "but [in America] many people are not impressed by that." There was also a telling strategic edge to the messaging too. Behind the folksy tone, the words of Ma and others balanced interest in external markets with reassurance to those in power domestically that the money would be largely invested there. In their fervour to embrace new markets, companies must not forget the domestic audience, whether consumers or politicians. "There would have been communication with the Chinese government in the run up [to the IPO], and any major companies for such a major exercise would need their blessings" states Bell Pottinger’s John Wong, who further adds that such a moves can be positioned as "raising the soft power" of the political establishment abroad. With the fears assuaged of both domestic and foreign markets, once those eight Alibaba sellers - who operate in a market of 279m ‘active buyers’ who use the company - rang the bell, it was the turn of the markets to speak. The value of good communications is sometimes hard to measure, but not this time — by the end of the day, shares had soared by 38 per cent. Chinese start-ups and ‘Alibaba wannabes’ are too caught up in equity culture, where the price-to-earnings equity ratio is the one and only focus. This leads to a missed opportunity to create a business that truly makes a difference. Recently I attended a competition where women business leaders pitched to institutional investors. While many of the ideas where great, I was struck by their inability to communicate and to win the trust required for an investment. The ones who stood out told their story in a way that went far beyond the numbers. Even Jack Ma, a good public speaker, has plenty of help on his messaging. Steve Jobs was the same. Things are changing, and more are starting to pick up on this point, but Chinese business leaders need to understand these skills are no longer ‘soft skills’ but a necessity when they become more active on the world’s stage. Messaging counts, but many Chinese entrepreneurs have not gone through the training in this discipline that is normal in Western businesses, and it is key for them to learn that vision and passion are crucial in communication.